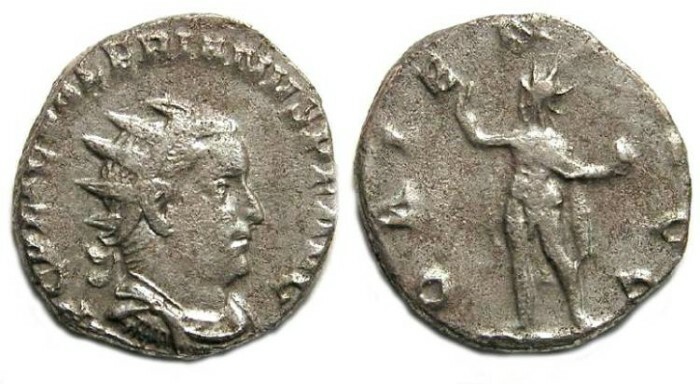 Denomination : Billon Antoninianus. Mint : Rome. Size : 21.5 x 22.5 mm. Weight : 3.73 grams. Grade : VF on a slightly small flan. Obverse : Radiate head of Valerian right, with IMP C P LIC VALERIANVS P F AVG around (parts of some letters are off the edge). Reverse : Sol advancing left, holding a globe, with ORIENS AVGG around. This is a very odd coin, in that at 3.73 grams it is almost a full gram heavier than normal for the issue, yet the flan smaller diameter (but much thicker at about 2 mm) than is normal for the issue.